We invite you to a morning seminar communicating legal innovations for the way we work, today and tomorrow. On Wednesday the 14th of March, we welcome you to experience a morning seminar in central London, challenging the corporate norm and expectations of workplace practice. 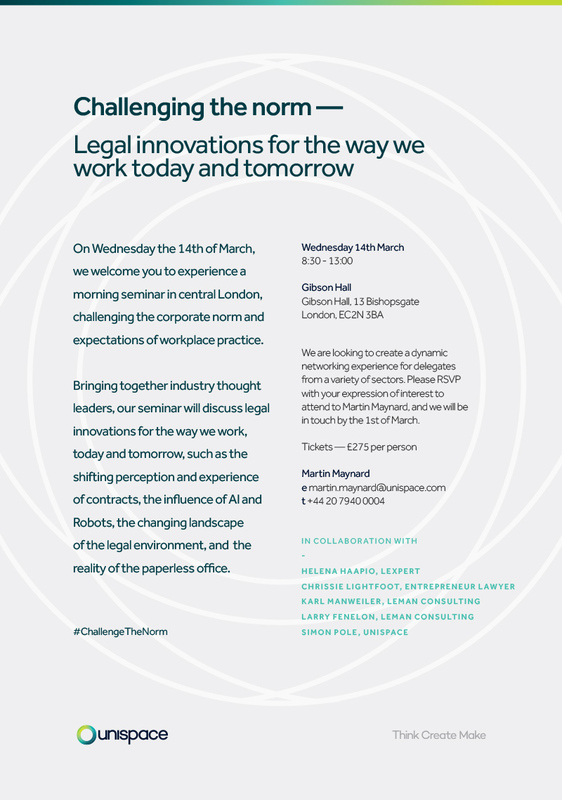 Bringing together industry thought leaders, our seminar will discuss legal innovations for the way we work, today and tomorrow, such as the shifting perception and experience of contracts, the influence of AI and robots, the changing landscape of the legal environment, and the reality of the paperless office. In collaboration with Helena Haapio from Lexpert, Chrissie Lightfoot from Entrepreneur Lawyer, Karl Manweiler and Larry Fenelon from Leman Consulting and Simon Pole from Unispace. For all ticket sales and event enquiries, please contact Martin Maynard (martin.maynard@unispace.com). We are looking to create a dynamic networking experience for delegates from a variety of sectors. Please rsvp with your expression of interest to attend, and we will be in touch by the 1st of March.